Earlier this year in May, the world watched the royal wedding of Prince Henry of Wales and Hollywood actress Megan Markle, now the Duke and Duchess of Sussex. 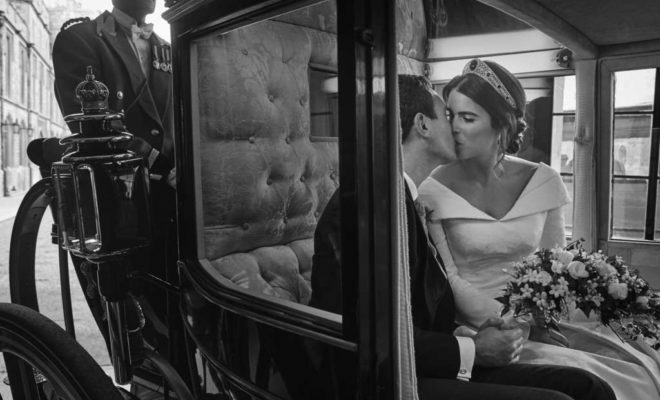 And just earlier this month, on 12 October, a second royal wedding took place between Princess Eugenie and Jack Brooksbank who tied the knot in an equally glamorous and royal affair. 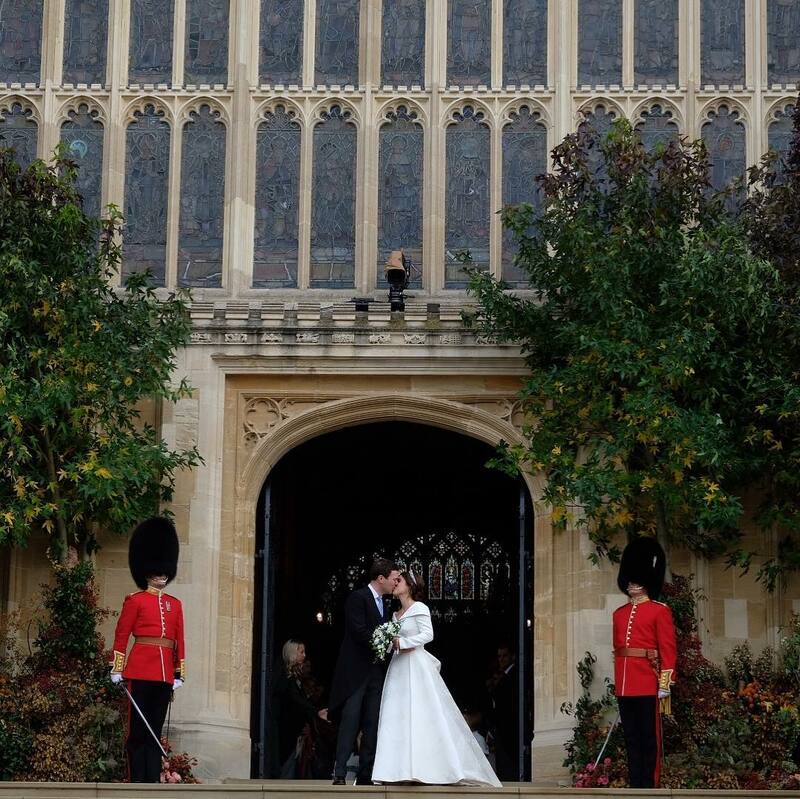 The couple kept to tradition by hosting their wedding on a weekday in St. George’s Chapel at Windsor Castle, the same venue as Prince Harry and Megan Markle. Following the wedding ceremony, a reception lunch was hosted by Queen Elizabeth in the Waterloo Chamber, the Grand Reception Room and St George’s Hall in Windsor Castle with the rest of the royal guests. The newlyweds held a second reception in the evening at the Royal Lodge, also Prince Andrew’s residence. 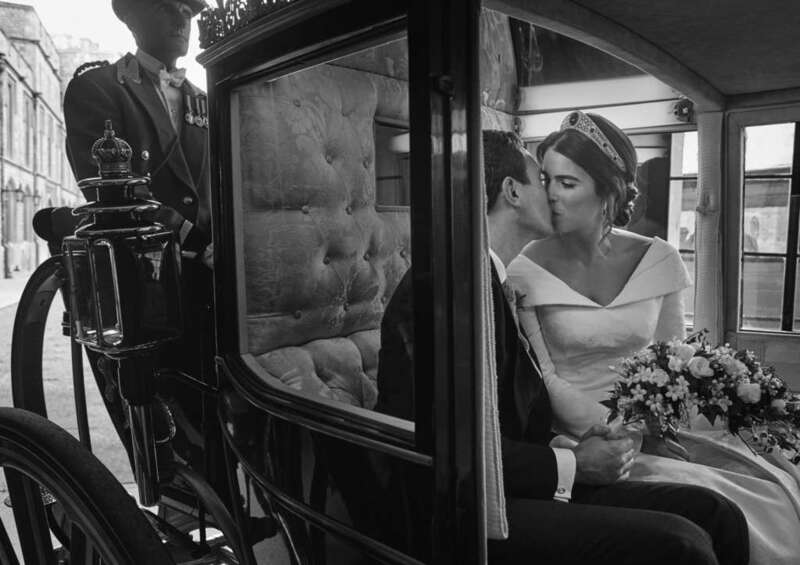 Princess Eugenie arrived at the chapel adorned in a breath-taking wide-neck wedding dress fit for a princess. 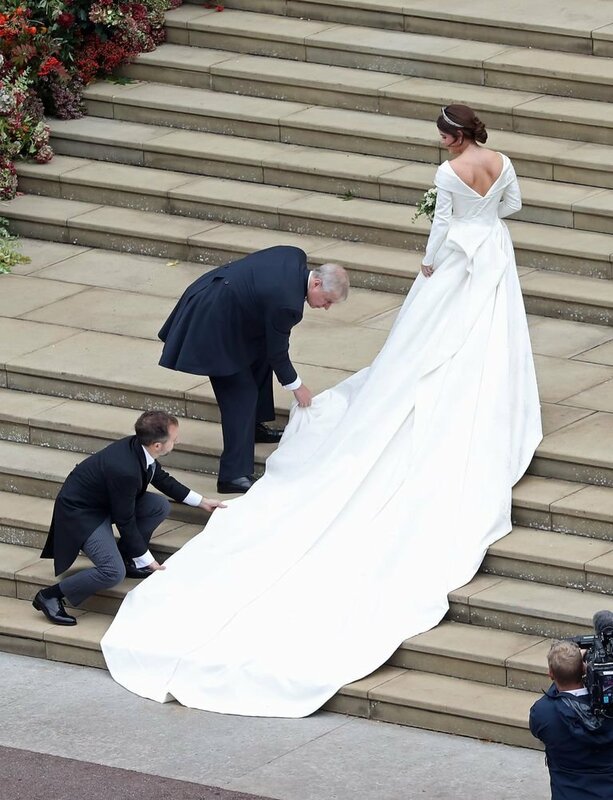 The gown, designed by Peter Pilotto and Christopher De Vos, also had a low back which proudly showcased the scars she obtained during a childhood surgery had to correct scoliosis. Her evening reception gown made the princess a vision of beauty in satin blush pink. Zac Posen designed the dress with a fitted waist and the shade of a blushed English rose, taking inspiration from the White Rose of York carefully embroidered on the shoulder and back of the dress that holds the cape in place. 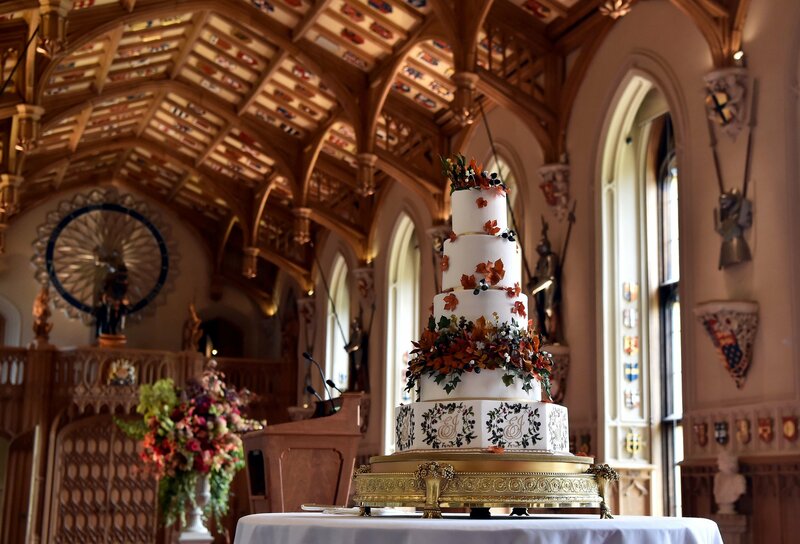 In true royal tradition, the wedding cake stood at five-tiers and was created and designed by London-based baker Sophie Cabot. 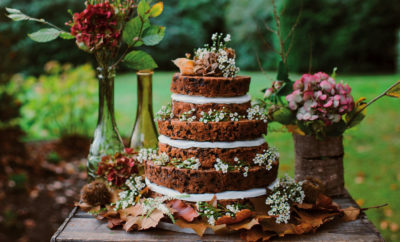 The red velvet and chocolate masterpiece took on an autumn theme with greenery and acorns, and had the couple’s initials ‘EJ’ looping around the bottom tier in an intricate fashion. Princess Eugenie and Jack Brooksbank cut the cake in a ceremonial act before mingling at the reception. The royal wedding reception lunch hosted by the queen included 800 guests, who nibbled on traditional English finger foods such as Scotch eggs and mini beef bites in Yorkshire pudding. 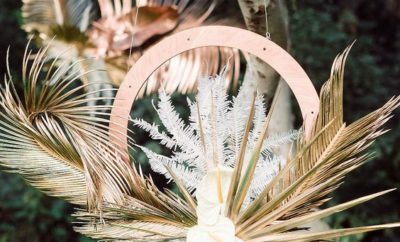 The evening reception took a much more relaxed turn with Princess Eugenie and Jack Brooksbank having a pizza food truck for their guests as well as Casamigos margaritas. As part of her bridal look, Princess Eugenie wore the Greville Emerald Kokoshnik Tiara, which was loaned to her by Queen Elizabeth. This theme was carried through to her evening gown, which she paired with a pair of emerald earrings specially made for her by now-husband Jack Brooksbank. The couple also exited the wedding venue in style in an Aston Martin DB10.